(This is the project for Week 4 of the Learn to Sew series.) Seriously, I need to stop sewing things for baby girls. Last week it was the dress and the shoes. This week a baby skirt. If I’m going to sew I ought to sew things that are useful to my life. But I just couldn’t resist this fabric! 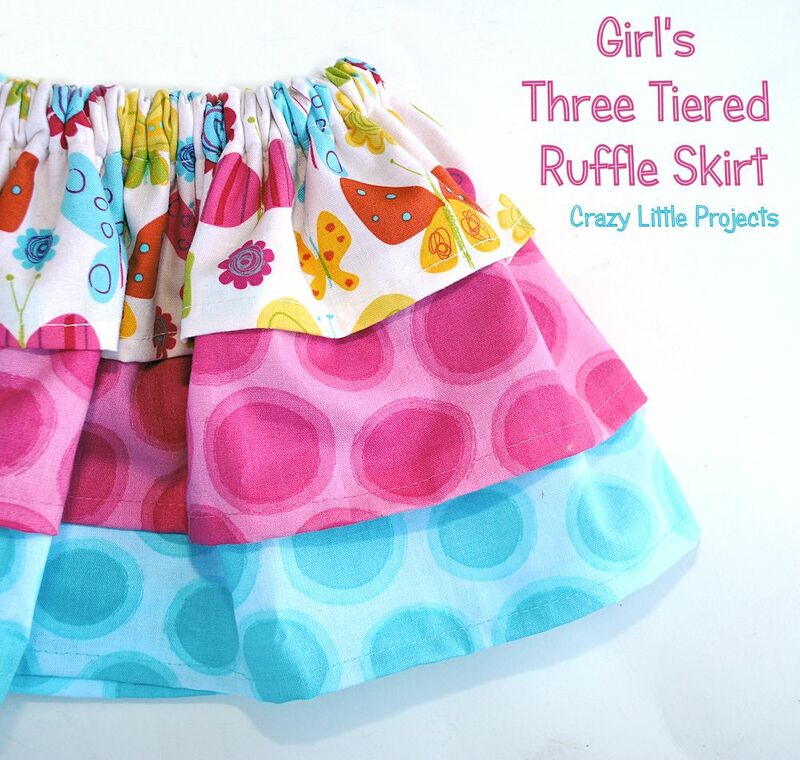 So, I made a three layer ruffled baby girl skirt. This skirt is so quick and easy! Probably a good project for a beginner to try. I think. Let me know how it goes. 3 coordinating fabrics-about 1/2 yard each for a baby or toddler size (you will have leftover) Get more though if you want to make this for an older girl. First you need to figure out how long you want your skirt. Mine fits about a 12 month size and is a total of 7 or 8 inches long when totally finished. You need to add a couple of inches when you are cutting to account for the hem at the bottom of the skirt and the elastic casing at the top. So, for my 12 month size, my top layer of fabric was cut about 6 inches by 42 inches. My second layer is about 8 inches by 42 inches and my third layer is about 10 inches by 42 inches. To figure out how long to make it if you want a different size you can measure your little girl from her waist to her knees or wherever you want the skirt to hit her and add 2-3 inches to compensate for the hem at the bottom and the elastic casing at the top and make that the width of your bottom fabric (as opposed to my 10 inches). Then make the middle layer 2-3 inches smaller than that and the top layer 2-3 inches smaller than the middle. To figure out how long to cut your fabric (as opposed to my 42 inches), measure her waist and then double it. You may have to piece some fabric together in order to get it long enough if you are sewing this for an older girl. Do that again, just like a hem-so that it’s folded down twice. 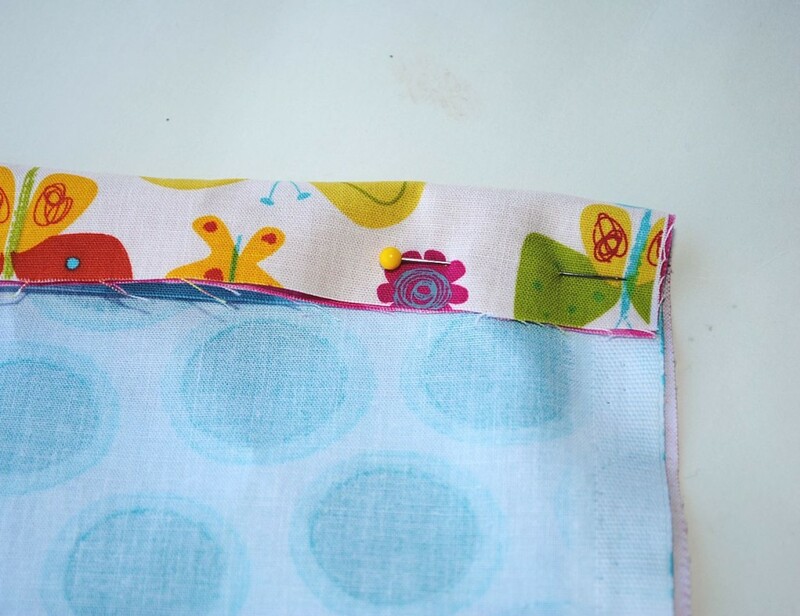 Sew along the bottom of that creating a casing for your elastic. Grab your large safety pin and attach it to the end of your elastic. Slide the safety pin into your little casing that you just made and pull. Continue to pull and slide your elastic into the casing. That’s it! You’re done. Was that easy? I hope that was easy! Then you go try it on your baby boy and hope he’s not scarred for life, but you have to try it on someone! This would look great with a pair of matching baby shoes. And seriously, I am vowing to take a break for sewing baby girl things for a while. OK then, you just gave me a nice excuse to keep sewing baby girl stuff. :) Thanks! So so cute! 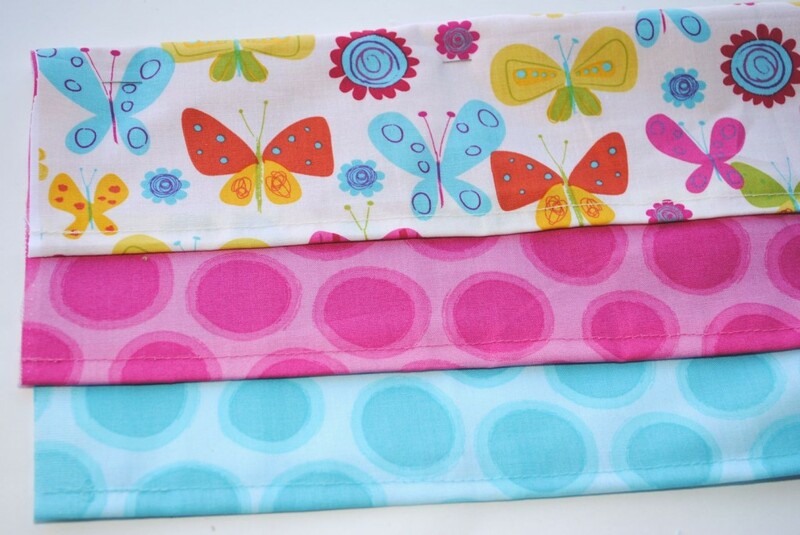 I love the fabrics you chose, they are adorable! Thanks so much for linking up with us at the Keep Calm & Link Up party – hope you are having a wonderful weekend so far! I love this skirt! What a fun way to put different fabrics and colors together. Pinning this! 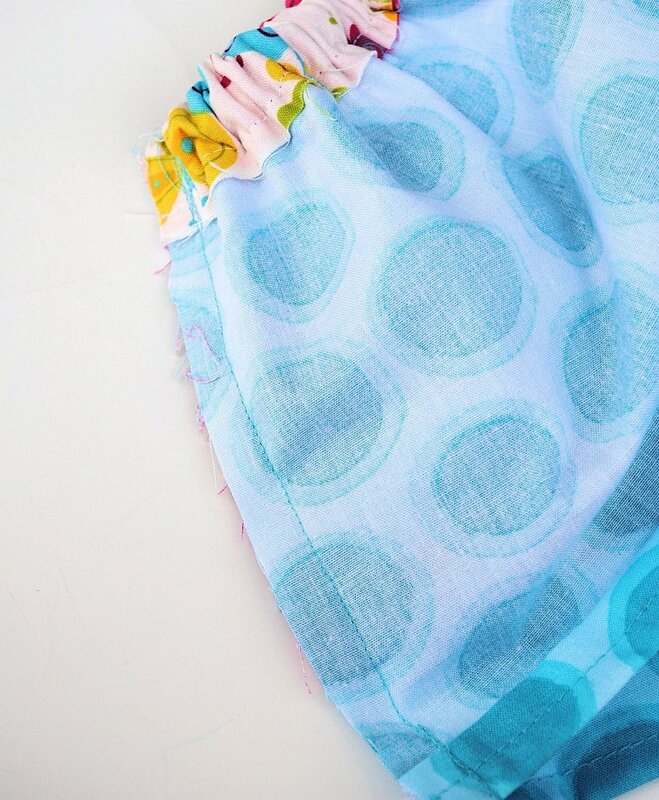 Love your choice of fabrics and the little girl things are just so darn cute — keep them coming! Thanks so much for sharing on Busy Monday! Hmmmm maybe you’re unconsciously telling hubby that you’re not done having kids yet Amber, and your dreams are telling you that it’s time for your girl :-D I’m loving these beautiful girls stuff and I have joined your “Learn to Sew” classes even though my sewing machine is basically a toy. I am checking out new machines though. We always thought we would have at least one more…maybe our girl. But I had some major, life threatening complications with the last so alas, I think we are done. Your tutorials are great and I love your fabric choices. 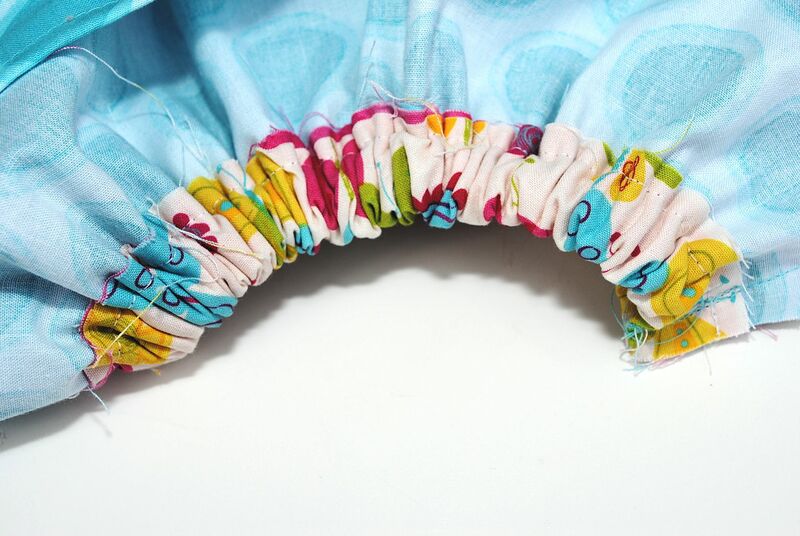 But when making the casing for the elastic turning the fabric under twice will avoid any freing. Thank you SO much for these lessons! I have successfully completed all of the others and this one is almost done. I am on the last step, sewing the sides together through all layers, but I can’t seem to sew over the top where the elastic is, it’s too thick. Do I need to change something on the machine to be able to sew something this thick? I had the same problem attaching the nose for the frog hooded towel. Thanks! Hmmm, my machine will sew through anything, so I forget that not all machines do that. Still, you should be able to get it through, you just have to pull and guide the fabric a little. Did you do it yet? Well, I have a VERY old machine (40 years old) that I got at a thrift store as I am just starting out. I talked with the ladies at my local fabric store and I think that’s the problem. I was able to jimmyrig it, but it’s not pretty. I couldn’t even get all the fabric under the foot. I am going to start looking for a new machine. Thanks for your help though! I made my daughter this skirt today and it did not turn out as pretty as yours! :-) I bought a knit fabric instead of just cotton. I think the store said fashion fabric or something. I also think I made it too long. I used 40 inches and my elastic made it really bunched together. I bought 3 1/2 yards like you said and can get two skirts out of it. I am able to learn from my mistakes on this skirt and make the second skirt better (I hope!). Thanks for the tutorial! Yes, you do have to sew through the elastic a little. Just try to make sure your seam goes far enough in that you hide all the bunching. Ya, that’s a good idea for a way to do it! 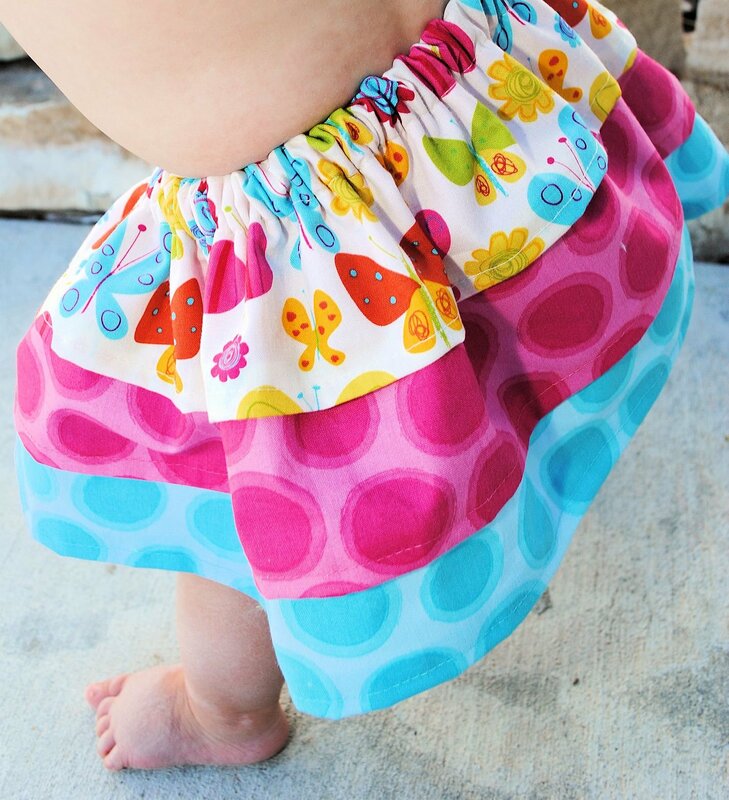 Do u have a video on this baby ruffle skirt. I haven’t tried any videos yet but I should sometime! Yes that would be great. I love all your project but I think by making Video would be so much better. Let me know when you make one. Thans for replying to me. Have a great day. I know-the thing that holds me back is that I think I will hate hearing myself on a video. 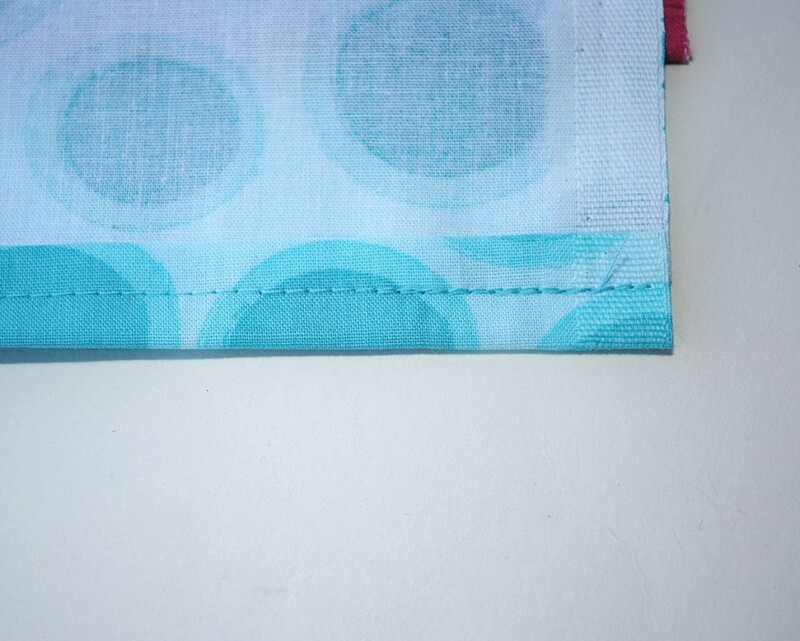 I am new to sewing and wondering why you wouldnt do this more like the pjs -where the top is sewn and then you add the elastic at the end – vice doing the elastic then sewing the sides? You definitely could. Either way works just fine. Making this tomorrow! Thanks for the easy how to! I made one today for my little one. First skirt I have made and it turned out great! Ty for the great tutorial. Glad it worked out well! I’m not seeing where you say what size elastic to use on the skirt. Any is fine. I think I used half inch. But if you are making it for someone older then use bigger. First of all, excellent, easy to follow tutorial. I already bought my fabric! Question: Why make the casing first then sew the sides? Why not sew the sides first? I’ve only made one other simple skirt but it had me sew the side seam up first then make the casing. Really you can do it either way. Doesn’t matter one way or another. Love the fabrics you used!! Very cute dress and nice tutorial!! Attempting this tonight! One question, when sewing the sides together, did you sew straight up and down or at a slight angle? When I picture straight up and down, I picture a square skirt, not ruffled. The pictures look like the top is smaller and slightly gets wider closer to the bottom. Thank you! I love the tutorial. I’m grandma to three lovely little girls, ages 6, 3, and 1. The older girls have “twirl” skirts as we call them. Brooke (3) wears them every day, over every thing. My youngest doesn’t have a twirl skirt and has been walking for about 6 weeks. Now that I’ve seen your tutorial, I’m going to make her one! Thanks! This might be a silly question, but why did you double the width? Wouldn’t that be way too much fabric? Sorry I’m a total newbie and wanted to make sure I read that correctly. That’s too allow for the ruffling. I loved this pattern! 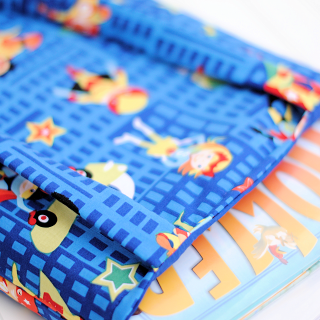 I made it for 3-6 month old size meaning the finished skirt was only 5 1/4″ long. I only did two layers. I read all the comments before starting this skirt, so I decided to do the elastic casing last since my machine struggles through too many layers. In the end, same results. <3 Thank you for the great tutorial! I can't wait to make another one. I love this ! I made one for my little girl !!! SO CUTE! Thank you !!! Oooh! I know exactly what my granddaughter is getting for Easter now! So cute I’m going to make this for my 15 month old. I am new to this I made Santa sacs at Christmas and the other night a pretty pink pillow for my dd with hearts sewing around the edges. I’m thinking of adding a inch to each fabric length she’s by all means not a big girl and sits @ the 50th percentile. We shall see how it turns out I’m so excited going to start cutting at nap time. I am a little new to sewing ( 1 year in August) and this was a breeze. My 6 year old daughter loved it. But it was sort of heavy, but it was probly just the fabric. The three layer were with a cotten fabric. Looks adorable – looking forward to making it. Quick question – assuming the one and only seam lays down the back of the skirt? I did not see it in the photo when you tried it on your little boy but this is the only logical conclusion – or is there in fact two side seams? Right-just one seam down the back. Keep sewing for the girls. I have 2 boys now grown. I’ve always sewn for my nieces. Now I get to sew for granddaughters and great nieces. Question because I have never seen a skirt sewn like this. I love this idea! If you connected each layer and sewed that seam and then put all 3 together wouldn’t it have greater freedom of movement? I’m so excited for all the stuff I’m sewing with your “learn to sew” series when I just got my first sewing machine a month ago (and I’m 33!)! They’re all very clear so far but with this one, I’m wondering if I got the wrong elastic or something. 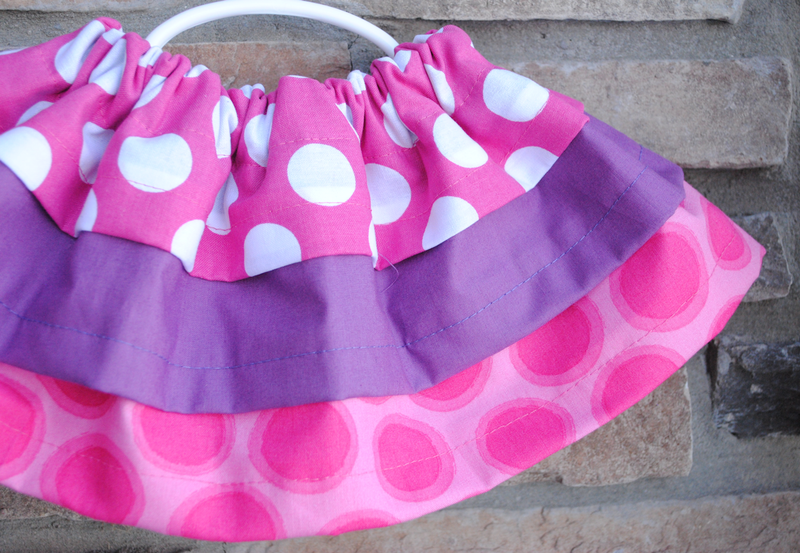 My little girl’s waist is about 19″ so I made the elastic 18″ and the fabric 36″. After I put the elastic in and sewed just the elastic together, I put it on her to see if it worked. It was almost as if there was just too much fabric bunched/ruffled up and it was stretching the elastic without it even being on her. The circumference of the skirt was about 21″ and definitely too big on her. I got a braided elastic 1/2″ wide. Is that right? I just cut 6″ off the three layers of fabric and made it work, but wondering if I should have looked for a “tougher” elastic…if they even make something like that. It sounds like it was just more fabric than you needed, not the elastic. Most any elastic should work fine. I made this today and it was adorable. But next time I will sew the sides together and then add the elastic. I don’t like the way it looks sewing through the elastic at all. Cute skirt though. Measure the length from your little girl’s waist to where you want the skirt to fall-like to her knees or whatever. That is your width. Then measure how wide her little waist is and use that measurement to create your lengths. About how much fabric will we next for a 6 to 7 year old? Honestly I am not sure! I have only made it for 18 months. I would say go ahead and do you measurements before you go to the fabric store and then calculate it from those. I LOVE this pattern! Cutting the fabric takes longer than making the skirt! Just made 2 for my granddaughter. Can’t wait to mail them tomorrow. Thank you so much, Amber. I love your tutorial. I’m new to sewing but want to make this for my 9 month old daughter. I am wondering how big the child you made the 12 month size was? My daughter is tall for her age so I’m just trying to figure out what size length to cut the fabric. He (ahem-yes, I was testing it out on my son) was on the small side. I love this skirt – so cute and quick. I made one using three different colors of the same snowman print for a friend’s 6-month old granddaughter and another for my 18 month old great-great niece! I added matching headband bows, appliqued shirts, and, for the 6-month-old, the Mary Janes (modified with ribbon ties, instead of Velcro straps). I call them “wishing for snow” ensembles. If only I could post a picture! This may be my new “go-to” gift for friends who are having baby girls! I forgot to mention that I sewed up the back seam before making the casing. I added the elastic and sewed up the opening as my last step. I’m considering making a 2-layer skirt with a front-tie sash as a modification of this pattern. Help!! I can’t find the instructions. I’ve made this skirt for my first 2 granddaughters and want to make one for my third and newest. Also want to make larger sizes for the older girls.